(CNN) Here’s a look at one of the most successful golfers in history, Tiger Woods. One of the most successful golfers in history, winning the Masters Tournament four times, the US Open three times, the PGA Championship four times, and the British Open three times. Woods leads the PGA in career victories among active players, and is the career money list leader. His father, Earl, nicknamed him “Tiger” after a South Vietnamese soldier with whom he had fought alongside during the Vietnam War. 1991 – Wins his first US Junior Amateur golf championship. Woods is the youngest winner ever. 1992 – Wins his second US Junior Amateur golf championship. February 27, 1992 – Competes in his first PGA tournament at the age of 16. He is given a sponsor’s exemption in order to play and is the youngest player ever to play in a PGA tournament at that time. 1993 – Wins his third US Junior Amateur golf championship. 1994-1996 – Wins three consecutive US Amateur golf championships. 1996 – Signs a five-year endorsement deal with Nike worth $40 million. 1996 – Woods earns $790,594 on the tour the year he turns pro. He also signs a reported $43 million worth of endorsement contracts. August 27, 1996 – Turns professional. January 21, 1997 – Announces the formation of the Tiger Woods Foundation for the promotion of minority participation in golf and other sports. April 13, 1997 – Wins his first Masters Tournament. May 19, 1997 – Signs an endorsement deal with American Express worth between $13 and $30 million. June 1997 – Becomes the No. 1 ranked golfer in the world after his 42nd week on the PGA Tour. At 21 years, 24 weeks, he is the youngest player ever to hold the No. 1 spot. August 15, 1999 – Wins his first PGA championship. June 18, 2000 – Wins his first US Open by 15-strokes, the largest margin in US Open history. July 23, 2000 – Wins his first British Open. September 14, 2000 – Signs a five-year endorsement contract with Nike. It is worth an estimated $85 million, making it the richest endorsement contract in sports history. June 16, 2002 – Wins his second US Open. December 8, 2003 – Named PGA Player of the Year for the fifth straight year. 2004 – Woods earns $86.3 million, $80 million of which comes from endorsement deals. May 13, 2005 – Woods fails to make the cut at the Byron Nelson Championship in Irving, Texas. It is the first time since 1998 that Woods is eliminated from a tournament. November 23, 2005 – Wins the PGA Grand Slam of Golf for a record-breaking sixth time. February 10, 2006 – Opens the Tiger Woods Learning Center, Anaheim, California. May 3, 2006 – Wood’s father, Earl Woods, dies of prostate cancer. July 23, 2006 – Wins his third British Open. August 20, 2006 – Wins his third PGA Championship. August 12, 2007 – Wins his fourth PGA Championship. April 15, 2008 – Undergoes arthroscopic surgery on his left knee. He had two prior surgeries on the same knee, first in 1994 to remove a benign tumor, and another arthroscopic surgery in December 2002. June 16, 2008 – Wins the US Open in sudden death, defeating Rocco Mediate. June 18, 2008 – Woods announces that he will undergo reconstructive Anterior Cruciate Ligament (ACL) surgery on his left knee and will miss the remainder of the PGA tour season. February 26, 2009 – After an eight-month hiatus from golf due to knee surgery, Woods plays the second round of the World Golf Championships Match Play and loses to Tim Clark. November 15, 2009 – Wins the Australian Masters. November 27, 2009 – Is taken to a hospital after being injured in a car accident in front of his home in Florida. He is released later the same day. December 2009 – Is named Athlete of the Decade by the Associated Press. February 19, 2010 – Makes a televised statement apologizing for being unfaithful to his wife and letting down both fans and family. March 16, 2010 – Announces he will begin his 2010 season at the Masters Tournament in April. October 31, 2010 – After 281 straight weeks, the longest in Official World Golf Ranking history, Woods loses his No. 1 ranking to Lee Westwood. 2010 – Loses about $20 million from estimated endorsements after sponsors including Gatorade, AT&T and Accenture end ties. Other sponsors including Nike, Upper Deck and EA Sports remain with Woods. June 7, 2011 – Announces he will miss the US Open due to knee and Achilles tendon injuries. June 20, 2011 – Earning an estimated $62,294,116, is ranked No. 1 on the Sports Illustrated annual “Fortunate 50” list of highest paid American athletes for the eighth straight year. July 19, 2011 – Woods announces that after a 12-year relationship, he and caddie Steve Williams will no longer be working together. August 4, 2011 – Returns to golf at the Bridgestone Invitational, after a nearly three-month lay-off. August 11, 2011 – Plays his worst first round of golf in a major championship. He fails to make the cut at the PGA championship for the first time in his career. October 3, 2011 – For the first time in 15 years, Woods does not make it onto golf’s top 50 players list, according to the official World Golf Ranking. October 5, 2011 – Signs new endorsement deal with Swiss watch-maker Rolex. December 4, 2011 – Wins the Chevron World Challenge, though not a PGA Tour event, his first win since November 2009. March 4, 2012 – Shoots a 62 at the Honda Classic at PGA National, his lowest final round as a professional, but ties for second in the tournament. March 25, 2012 – Earns his first PGA Tour win, in the Arnold Palmer Invitational in Orlando, since September 2009. June 3, 2012 – Ties Jack Nicklaus on 73 PGA Tour victories at the Memorial Tournament. July 2, 2012 – Beats Jack Nicklaus’ PGA Tour record with the AT&T National win. 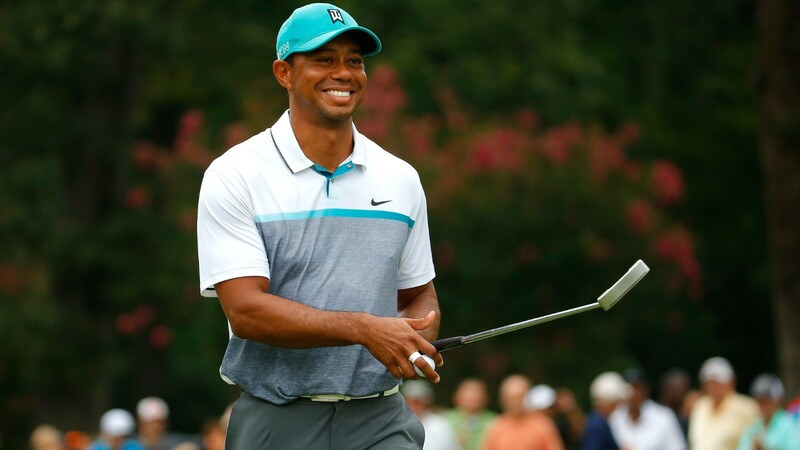 Woods’ 74th PGA Tour win ranks him in second place for the all-time list behind Sam Snead with 82 wins. July 2012 – Loses the title of world’s best-paid athlete on the Fortunate 50, the Sports Illustrated ranking of the top-paid US athletes. Boxer Floyd Mayweather Jr. is listed as No. 1, knocking Woods out of the top spot for the first time since the list began in 2004. September 3, 2012 – Becomes the first PGA tour participant to earn $100 million; places third in the Deutsche Bank Championship, earning more than $500,000, putting his career high at $100,350,700. January 28, 2013 – Wins 75th PGA tour title. March 25, 2013 – Woods wins the Arnold Palmer Invitational for the eighth time. He regains the No. 1 spot. May 12, 2013 – Wins his 78th PGA tour title at the Players Championship. He is still ranked second for all-time victories, behind Sam Snead with 82 wins. October 28, 2013 – Video game company Electronic Arts announces the end of its 15-year relationship with Woods. March 31, 2014 – Woods undergoes back surgery for a pinched nerve. August 23, 2015 – Woods posts a top-ten finish at his debut at the Wyndham Championships but ends his season as the 257th ranked player in the world. His finish was four shots off eventual winner Davis Love III. Woods has now missed the cut for three majors in a row. December 1, 2015 – Woods announces that he underwent his third microdiscectomy surgery last month — a procedure to remove bone around a pinched nerve to allow space for it to heal — and admits he has no idea when he will be back on the course. July 20, 2016 – It is announced that Woods will miss the PGA Championship due to his continued recovery from back surgery. This marks the first time in his career that he has missed all four major championships. December 4, 2016 – Woods finishes 14 shots behind the winner in the Hero World Challenge, his first competitive event in over a year.